Curious about what makes Cádiz so wonderful? I'm a former naval officer, now a freelance photographer living in Cádiz. Isabel and I have recently refurbished this apartment located in Cádiz Historic Center on a 17th century building. We are doing our best to accommodate your needs, so any questions, any issues, please feel free to ask, we will be ever so happy to assist. Live like a local and find out for yourself at our newly renovated, one-bedroom apartment in downtown Old Cádiz. Comfortably blending modern conveniences with historic charm, the apartment sits in a +340-year-old building next to Plaza de España, Plaza de San Francisco and Plaza de Mina - perfectly situated to sample some of Cádiz's favorite pastimes, like walking to La Caleta beach along the coast through beautiful Alameda Apodaca and Genovese Park. The area is very busy during the Carnival of Cadiz and Easter. At that time events that bring together large numbers of people are organized, with performances and Easter pasos until the wee hours of the morning, which can be seen from the balconies of the house. 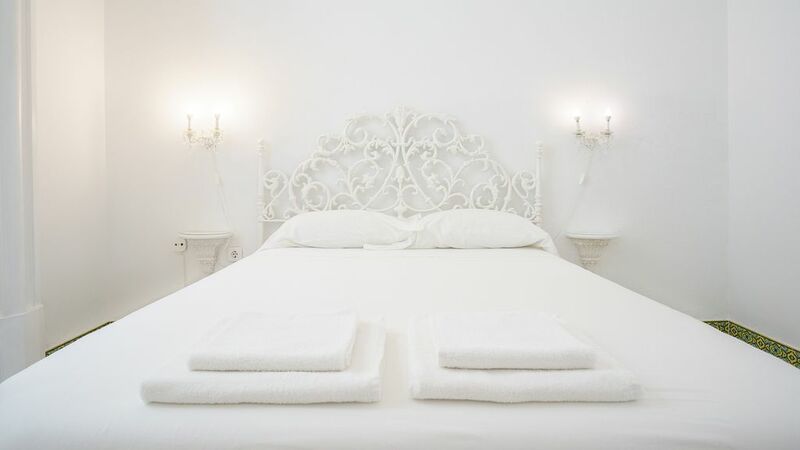 Its location just 50 meters from the Archaeological Museum of Cadiz in Plaza de Mina, 200 meters from Plaza de España and 20 meters from the Plaza de San Francisco, is ideal to taste the history of eighteenth century Cadiz. It is surrounded by restaurants, bars, terraces and shops. Just 250 meters from the Plaza de las Flores and the Central Market in Cadiz. The spacious bathroom is finished with white tiles on the walls and black slate tiles on the floor. It has a walking shower a classic antique washbasin with a ceramic light fixture and a bidet. Clean towels, hair dryer, shower gel and shampoo are provided. Suitable for the disabled, you can access through the elevator without any hindrance. The bright and clear living room of 14 m2 is furnished with two three-seater sofas, a glass coffee table with wooden legs and a corner table with a cast-iron footboard and marble top. A spacious and bright kitchen of 15 m2, fully equipped with everything you need to enjoy a few days in Cádiz. Maravilloso y céntrico apartamento con todas las comodidades .Pablo, nuestro anfitrión, de 10. Apparemment bien situé, très grand et bien équipé.